After having calculated that Texas has executed 54 innocent people, and after having vowed to review all 451 Texas lethal injections in search of those 54, I have developed an Actual Innocence Scoring program to allow summarizing and ranking of the cases. I'll introduce that scoring system below using Robert Nelson Drew as an example of someone who scored well (84 out of 100) and Melvin Wayne White as an example of someone who scored poorly (0 out of 100). The Skeptical Spouse and I develop custom database solutions for a small list of clients using a database system called Filemaker. I naturally turned to that software when faced with organizing and bringing some sense to all the data I am collecting about the 451 executions. By comparison with the solutions we develop for our clients, the Actual Innocence Scoring software is exceptionally simple. It is nonetheless my primary tool for evaluating the cases. I wish to clarify up front that my scoring program does not and can not remove the subjective nature of my evaluation. The program merely allows me (forces me) to condense the case to a single screen, to consider individually the primary evidentiary components of a case, to assign a subjective score to each of those components, and to apply weighting factors to calculate an overall Actual Innocence Score. To see the scorecard for Robert Nelson Drew, click on the image to the left. The scorecard for Melvin Wayne White is down and to the right (click "Read more"). Open either for a nearly full screen image in which the text becomes readable. Convict's name is at the upper left. The Actual Innocence Score is just below the name. 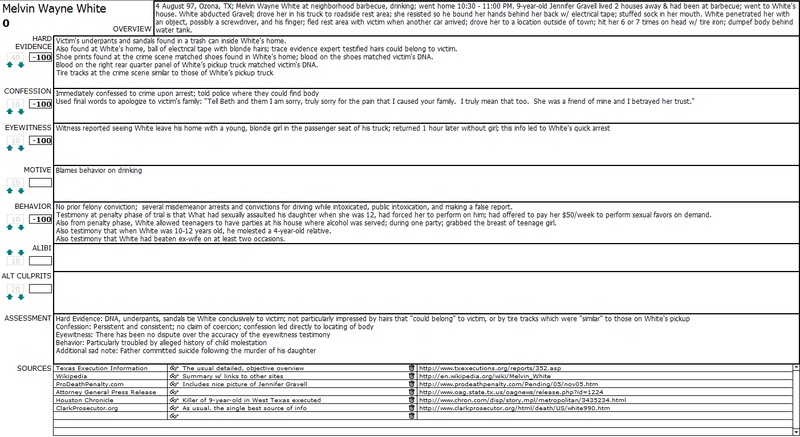 The top portion of the scorecard prevents a brief overview of the case. Text blocks are available for seven self-explanatory categories of evidence. I use these evidentiary text blocks to summarize and record an impartial (hopefully) breakdown of facts relevant to the person's guilt or innocence. I use the Assessment text block to record my thoughts regarding the significance of the evidence summarized above. Once I have filled in the numeric values for each of the evidence categories, the overall score (ranging from 0 to 100) appears at the top left of the screen underneath the person's name. I'll attempt to clarify the meaning and value of all this in my next post. For now, I ask that you consider for just a moment the evidentiary chasm between the case of Melvin Wayne White (0) and that of Robert Nelson Drew (84). White freely confessed to sexually molesting and brutally murdering a young girl. DNA evidence tied him to the crime, as did other physical evidence. Eyewitness testimony added to the case against him. He had a history of child molestation. Drew maintained his innocence from beginning to end. He was convicted almost exclusively on the strength (and I use that term advisedly) of a single eyewitness, one who had also been arrested for the crime. The police suppressed his initial tape-recorded interview in which he claimed to have not witnessed the crime, a claim he backed up with a successful polygraph test. He changed his story at trial, only to recant later. Though another person confessed to the killing and cleared Drew of all involvement, the Court refused to take any note of that confession. Were the death penalty to be limited to cases such as White's, I would stand mute on the subject. As long as it is used in cases such as Drew's, I will oppose it. im so glad to see and here someone else out here in this harsh world see the death penalty as i do in whites case execute him in drews case a lesser sentence is more suitable and i oppose the death penalty in drew case as well.